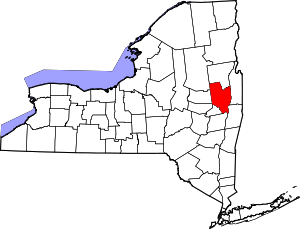 This is intended to be a complete list of properties and districts listed on the National Register of Historic Places in Saratoga County, New York. The locations of National Register properties and districts (at least for all showing latitude and longitude coordinates below) may be seen in a map by clicking on "Map of all coordinates". Four of the properties and districts are further designated U.S. National Historic Landmarks. 43°12′33″N 74°03′21″W﻿ / ﻿43.209167°N 74.055833°W﻿ / 43.209167; -74.055833﻿ (Batchellerville Presbyterian Church) Batchellerville Greek Revival Presbyterian church built in 1867. 43°12′46″N 73°35′08″W﻿ / ﻿43.212778°N 73.585556°W﻿ / 43.212778; -73.585556﻿ (Col. Sidney Berry House) Northumberland Historic house built about 1800. 42°48′44″N 73°49′34″W﻿ / ﻿42.812222°N 73.826111°W﻿ / 42.812222; -73.826111﻿ (Abraham Best House) Vischer Ferry Federal style house, built ca. 1815. 43°00′07″N 73°51′22″W﻿ / ﻿43.001944°N 73.856111°W﻿ / 43.001944; -73.856111﻿ (Brookside) Ballston Spa 1793 house, modified later, was first built at springs for travelers. James Fenimore Cooper wrote part of Last of the Mohicans there. Now home to county historical society. 43°05′56″N 73°34′54″W﻿ / ﻿43.098958°N 73.581675°W﻿ / 43.098958; -73.581675﻿ (Bullard Block) Schuylerville Commercial building built in 1881 in the High Victorian Gothic style. (#100000498) 85 Lake Hill Rd. 43°04′41″N 73°47′05″W﻿ / ﻿43.078056°N 73.784722°W﻿ / 43.078056; -73.784722﻿ (Canfield Casino and Congress Park) Saratoga Springs Site of early bottling plant and hotel now used as public park and history museum. Designated a National Historic Landmark District on February 27, 1987. 42°47′57″N 73°41′22″W﻿ / ﻿42.799167°N 73.689444°W﻿ / 42.799167; -73.689444﻿ (Catawissa (tugboat)) Waterford Tugboat built in 1896-1897 and scrapped in 2008. 43°10′00″N 73°33′24″W﻿ / ﻿43.166667°N 73.556667°W﻿ / 43.166667; -73.556667﻿ (Champlain Canal) Troy 60-mile (97 km) canal connecting the south end of Lake Champlain to the Hudson River in New York constructed simultaneously with the Erie Canal. 42°56′02″N 73°57′55″W﻿ / ﻿42.933889°N 73.965278°W﻿ / 42.933889; -73.965278﻿ (Charlton Historic District) Charlton 123-acre (50 ha) district at the hamlet of Charlton. Includes 37 contributing buildings dating to 1787 and includes notable Greek Revival and Italianate architecture. 42°51′31″N 73°49′55″W﻿ / ﻿42.858611°N 73.831944°W﻿ / 42.858611; -73.831944﻿ (Clifton Park Center Baptist Church and Cemetery) Clifton Park Center Baptist church and cemetery built in 1837. 42°51′57″N 73°46′15″W﻿ / ﻿42.865833°N 73.770833°W﻿ / 42.865833; -73.770833﻿ (Clifton Park Hotel) Clifton Park and Halfmoon Historic hotel erected in the 1820s. 43°13′15″N 74°06′05″W﻿ / ﻿43.2207°N 74.1015°W﻿ / 43.2207; -74.1015﻿ (Copeland Carriage Shop) Beecher Hollow Small 1830s Federal style wooden building is rare surviving example of a rural manufacturing facility, later used as machine shop and vacant since 1916. 42°49′29″N 73°43′53″W﻿ / ﻿42.824722°N 73.731389°W﻿ / 42.824722; -73.731389﻿ (Crescent Methodist Episcopal Church) Crescent Methodist Episcopal church, built in 1852 and demolished sometime before 2013. 42°56′12″N 73°47′38″W﻿ / ﻿42.936739°N 73.793834°W﻿ / 42.936739; -73.793834﻿ (Davis-Ferris Organ) Round Lake Oldest three-manual organ in the nation. 43°05′06″N 73°47′45″W﻿ / ﻿43.085°N 73.795833°W﻿ / 43.085; -73.795833﻿ (The Drinkhall) Saratoga Springs Historic trolley station built in 1915 by the Hudson Valley Railroad. 43°11′56″N 73°39′06″W﻿ / ﻿43.198889°N 73.651667°W﻿ / 43.198889; -73.651667﻿ (Dutch Reformed Church of Gansevoort) Gansevoort Dutch Reformed church, built about 1840 and demolished 1996. 43°04′49″N 73°46′41″W﻿ / ﻿43.080278°N 73.778056°W﻿ / 43.080278; -73.778056﻿ (East Side Historic District) Saratoga Springs Intact residential area of well-to-do 19th century residents east of downtown. 42°53′53″N 73°41′32″W﻿ / ﻿42.898056°N 73.692222°W﻿ / 42.898056; -73.692222﻿ (Col. Elmer E. Ellsworth Monument and Grave) Mechanicville Monument to Elmer E. Ellsworth, the first casualty of the American Civil War, built in 1874. 43°11′48″N 73°39′13″W﻿ / ﻿43.196667°N 73.653611°W﻿ / 43.196667; -73.653611﻿ (Gansevoort Mansion) Gansevoort House built in 1813 by Herman Gansevoort (1779–1862). 42°52′07″N 73°51′57″W﻿ / ﻿42.868742°N 73.865961°W﻿ / 42.868742; -73.865961﻿ (Nathan Garnsey House) Rexford Unaltered example of Federal architecture, ca. 1791. 43°04′42″N 73°47′30″W﻿ / ﻿43.078333°N 73.791667°W﻿ / 43.078333; -73.791667﻿ (Gideon Putnam Burying Ground) Saratoga Springs Early graveyard contains grave of city founder and his family. Only trace of him on the city's West Side. 43°12′03″N 73°44′45″W﻿ / ﻿43.200833°N 73.745833°W﻿ / 43.200833; -73.745833﻿ (Grant Cottage) Mount McGregor Cottage first owned by banker Joseph W. Drexel. It was the site where Ulysses S. Grant died in 1885. 42°50′05″N 73°50′41″W﻿ / ﻿42.834722°N 73.844722°W﻿ / 42.834722; -73.844722﻿ (Grooms Tavern Complex) Grooms Corners Historic tavern located at Grooms Corners. The complex consists of the 1825 tavern, a wagon and blacksmith shop, and a frame privy. 43°22′26″N 73°57′03″W﻿ / ﻿43.373889°N 73.950833°W﻿ / 43.373889; -73.950833﻿ (Hadley Mountain Fire Observation Station) Hadley Historic fire observation station built in 1917. 43°18′50″N 73°50′44″W﻿ / ﻿43.313889°N 73.845556°W﻿ / 43.313889; -73.845556﻿ (Hadley Parabolic Bridge) Hadley Built in 1895. Only iron semi-deck lenticular truss bridge extant in state. 42°54′37″N 73°49′24″W﻿ / ﻿42.910278°N 73.823333°W﻿ / 42.910278; -73.823333﻿ (Jonesville Store) Jonesville Country store at Main Street and Longkill Road; now vacant. 43°06′40″N 73°34′50″W﻿ / ﻿43.111111°N 73.580556°W﻿ / 43.111111; -73.580556﻿ (Marshall House) Schuylerville Farmhouse constructed in 1770–1773 used by the British as a field hospital during the Battles of Saratoga. 43°00′57″N 74°01′20″W﻿ / ﻿43.015833°N 74.022222°W﻿ / 43.015833; -74.022222﻿ (Mead House) Galway House built about 1825. 42°52′41″N 73°40′47″W﻿ / ﻿42.878056°N 73.679722°W﻿ / 42.878056; -73.679722﻿ (Mechanicville Hydroelectric Plant) Mechanicville Powerhouse, earth embankment, concrete non-overflow dam, and 700 feet long concrete gravity overflow dam built in 1897-1898. 42°50′00″N 73°50′37″W﻿ / ﻿42.833398°N 73.843512°W﻿ / 42.833398; -73.843512﻿ (Mohawk Valley Grange Hall) Grooms Corners Grange hall built in 1791. 42°47′06″N 73°41′34″W﻿ / ﻿42.785°N 73.692778°W﻿ / 42.785; -73.692778﻿ (Northside Historic District) Waterford District dating to 1828 characterized by large and small structures including the mansions of mill owners and modest workers' dwellings. 42°49′25″N 73°43′58″W﻿ / ﻿42.823611°N 73.732778°W﻿ / 42.823611; -73.732778﻿ (Noxon Bank Building) Crescent Bank built in 1842. 42°49′28″N 73°43′49″W﻿ / ﻿42.824444°N 73.730278°W﻿ / 42.824444; -73.730278﻿ (Oakcliff) Crescent Historic house built about 1840. 42°47′18″N 73°41′00″W﻿ / ﻿42.788333°N 73.683333°W﻿ / 42.788333; -73.683333﻿ (Ormsby-Laughlin Textile Companies Mill) Waterford Textile mill built circa 1894; it is the only surviving factory associated with the major industrial community known as Dial City. 43°18′00″N 73°37′27″W﻿ / ﻿43.3°N 73.624167°W﻿ / 43.3; -73.624167﻿ (Parks-Bentley House) South Glens Falls House in built about 1840. 43°05′22″N 74°02′28″W﻿ / ﻿43.0893383°N 74.0410594°W﻿ / 43.0893383; -74.0410594﻿ (Packer Farm and Barkersville Store) Middle Grove Mid-19th century house moved to property and store built later are excellent examples of local vernacular architecture from the periods. 43°04′59″N 73°50′40″W﻿ / ﻿43.083056°N 73.844444°W﻿ / 43.083056; -73.844444﻿ (Petrified Sea Gardens) Saratoga Springs Site of discovery of stromatolites; New York State Paleontologist Winifred Goldring, a pioneering 19th-century woman in science, researched them extensively here. 43°18′01″N 73°56′31″W﻿ / ﻿43.300144°N 73.942019°W﻿ / 43.300144; -73.942019﻿ (David Rayfiel House) Day Modern Movement style house built in 1958. 42°51′20″N 73°53′21″W﻿ / ﻿42.855556°N 73.889167°W﻿ / 42.855556; -73.889167﻿ (Cyrus Rexford House) Rexford Stick Style Victorian house built in 1883. 42°56′14″N 73°47′41″W﻿ / ﻿42.937222°N 73.794722°W﻿ / 42.937222; -73.794722﻿ (Round Lake Historic District) Round Lake Notable collection of late 19th century structures which are remarkably homogeneous. Moreau British fortification that was part of the Fort Edward/Rogers Island military complex during the French and Indian War. 43°05′48″N 73°35′02″W﻿ / ﻿43.096667°N 73.583889°W﻿ / 43.096667; -73.583889﻿ (St. Stephen's Episcopal Church) Schuylerville Gothic Revival style Episcopal church built in 1868. 43°05′24″N 73°46′32″W﻿ / ﻿43.09°N 73.775556°W﻿ / 43.09; -73.775556﻿ (Saratoga Gas, Electric Light and Power Company Complex) Saratoga Springs Two buildings remain from early gas-generating power station started in 1873. Site also has archeological evidence of other buildings. 42°59′24″N 73°38′02″W﻿ / ﻿42.99°N 73.633889°W﻿ / 42.99; -73.633889﻿ (Saratoga National Historical Park) Saratoga The park preserves the site of the Battles of Saratoga, the first significant American military victory of the American Revolutionary War in 1777. 43°05′54″N 73°35′05″W﻿ / ﻿43.098333°N 73.584722°W﻿ / 43.098333; -73.584722﻿ (Old Saratoga Reformed Church) Schuylerville Reformed Church in America church built in 1857 in the Greek Revival style. 42°53′35″N 73°49′16″W﻿ / ﻿42.893165°N 73.821239°W﻿ / 42.893165; -73.821239﻿ (Smith's Grain and Feed Store) Elnora Coal yard and grain business of George Smith at Elnora railroad crossing. 42°56′20″N 73°39′15″W﻿ / ﻿42.938889°N 73.654167°W﻿ / 42.938889; -73.654167﻿ (Stillwater United Church) Stillwater Historic church designed by noted architect Marcus F. Cummings and built in 1873. 43°04′16″N 73°45′56″W﻿ / ﻿43.071111°N 73.765556°W﻿ / 43.071111; -73.765556﻿ (Union Avenue Historic District) Saratoga Springs Union Avenue includes a number of stately Victorian houses built in the second half of the nineteenth and early twentieth centuries. 43°00′33″N 73°51′04″W﻿ / ﻿43.009167°N 73.851111°W﻿ / 43.009167; -73.851111﻿ (Union Mill Complex) Ballston Spa Center of George West's paper-bag–making business. Later a chocolate factory and today a retail complex. 42°47′47″N 73°41′15″W﻿ / ﻿42.796389°N 73.6875°W﻿ / 42.796389; -73.6875﻿ (URGER (canal tugboat)) Waterford Historic canal tugboat built in 1901. 43°00′01″N 73°50′59″W﻿ / ﻿43.000278°N 73.849722°W﻿ / 43.000278; -73.849722﻿ (Verbeck House) Ballston Spa Rare late residence by Marcus F. Cummings. Later used as National Bottle Museum. 43°05′21″N 73°35′31″W﻿ / ﻿43.089083°N 73.591883°W﻿ / 43.089083; -73.591883﻿ (Victory Mills) Victory Historic textile mill building built in 1918. (#75001224) Southwest of Clifton Park at the junction of River View, Vischer Ferry, and Crescent Rds. 42°47′41″N 73°49′12″W﻿ / ﻿42.794722°N 73.82°W﻿ / 42.794722; -73.82﻿ (Vischer Ferry Historic District) Clifton Park Located along the Erie Canal, the district contains several historic structures including the Nicholas and Eldret Vischer House, dating from the mid-1700s. 42°47′26″N 73°40′46″W﻿ / ﻿42.790556°N 73.679444°W﻿ / 42.790556; -73.679444﻿ (Waterford Village Historic District) Waterford The district dates to 1799 and includes Greek Revival, Late Victorian and Federal architecture. 42°58′22″N 74°01′50″W﻿ / ﻿42.972778°N 74.030556°W﻿ / 42.972778; -74.030556﻿ (West Charlton United Presbyterian Church) West Charlton Presbyterian church built about 1880 by immigrants from Scotland. 42°59′47″N 73°47′28″W﻿ / ﻿42.996389°N 73.791111°W﻿ / 42.996389; -73.791111﻿ (Wiggins-Collamer House) Malta Historic house built about 1835. 43°04′05″N 73°45′29″W﻿ / ﻿43.068°N 73.758°W﻿ / 43.068; -73.758﻿ (Yaddo) Saratoga Springs Former house of financier Spencer Trask and his wife, the writer Katrina Trask. Now an artists' colony. Malta Historic stone arch bridge in Malta in Saratoga County, New York over Ballston Creek. Constructed about 1873; collapsed in 1993. Wikimedia Commons has media related to National Register of Historic Places in Saratoga County, New York.